Disclaimer: Disney sent me to Walt Disney World on an all-expenses paid trip, in exchange for my coverage of the #ZootopiaEvent, which included a stay at Disney’s Animal Kingdom Lodge Resort. All opinions are my own. Drums beating just steps away. A fire-pit surrounded by dark rocking chairs calling your name. 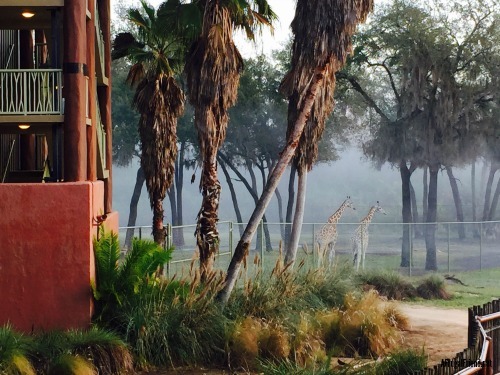 The fog burning off in the morning to reveal giraffes not far off in the distance. Though it sounds like the heart of Africa, it’s actually Orlando, Florida. 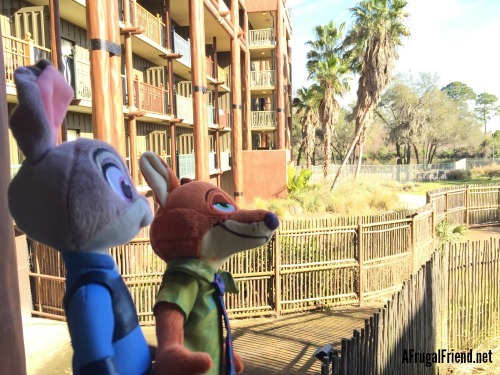 Disney’s Animal Kingdom Lodge became home away from home this week while on a press trip for Disney’s much-anticipated animated film, ZOOTOPIA. And though I’ve had visions of flying off to Africa for years, this unique resort at Walt Disney World has provided me exactly the experiences I dreamed about. So I’m sharing everything you’ll want to know. 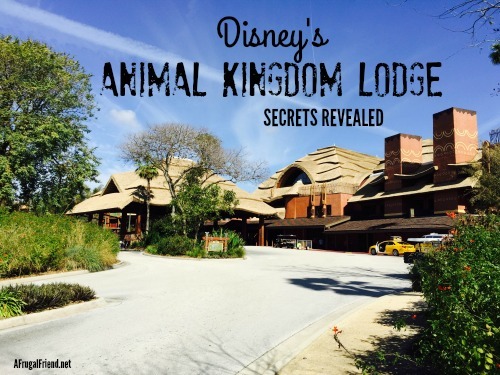 Disney’s Animal Kingdom Lodge – Secrets Revealed! This wasn’t the first time I’d stayed in the resort. About 5 years ago, I spent one night there with my family, before resort-hopping to experience two others on Disney property. Why on property(?) – the benefits (more on that later)! I learned several important things from that one-night stay. One night is not enough – You need more time to enjoy all that Animal Kingdom Resort has to offer. Don’t head to Disney Parks right away – Take at least one full day to enjoy the resort amenities before focusing on Disney Parks. 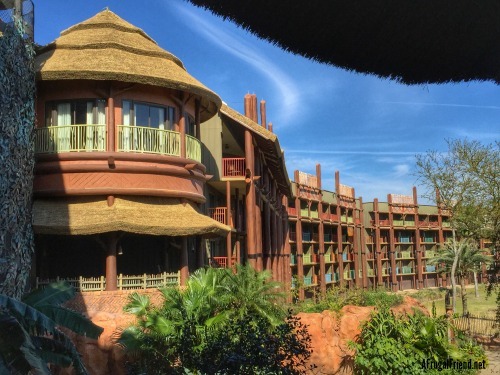 Consider this resort even if not heading to the parks – A stay at Animal Kingdom Lodge is a trip unto itself. Staying at a Disney resort transports you to another place, another time. There’s something inherently magical in that. 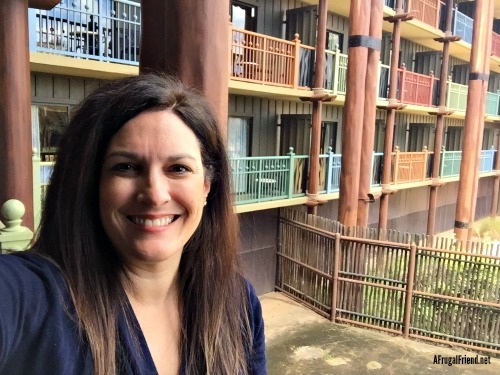 At Disney’s Animal Kingdom Lodge, you are welcomed “home” at its’ entrance, and it truly doesn’t take long for the massive resort to feel like home. And when I say massive, I mean massive. In fact, Disney’s Animal Kingdom Lodge has two distinct parts, Jambo House and Kidani Village, each with a different entrance, lobby, and bus stop. The larger than life resort gets its’ inspiration from a traditional African kraal (horseshoe-curved design). This makes for happy guests, as the resort overlooks 4 different savannas. 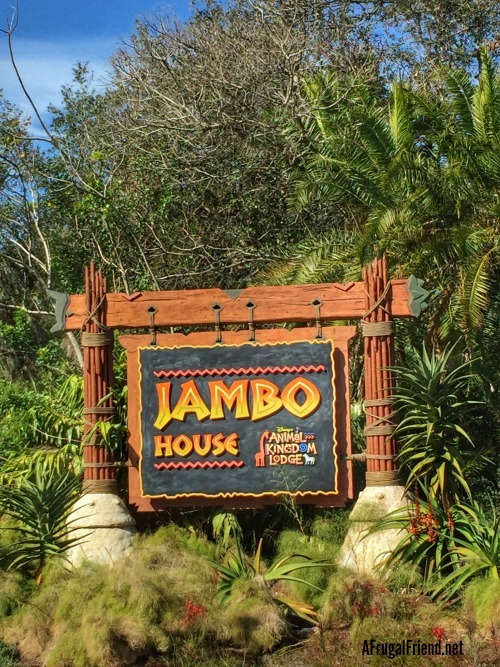 SECRET: Many of the Disney Cast Members stationed throughout the resort are in fact FROM AFRICA. From the registration desk and restaurants to the Arusha Rock Savanna Overlook, be on the lookout. Their name badge will indicate where they are from. These Cast Members are a wealth of information about their native countries. Ask questions. Better yet, have the kids come up with questions. It’s so educational. SECRET: HIDDEN MICKEY – There are many viewing points at the resort from which to see the savannas, including the popular Arusha Rock Savanna Overlook just outside the lobby. 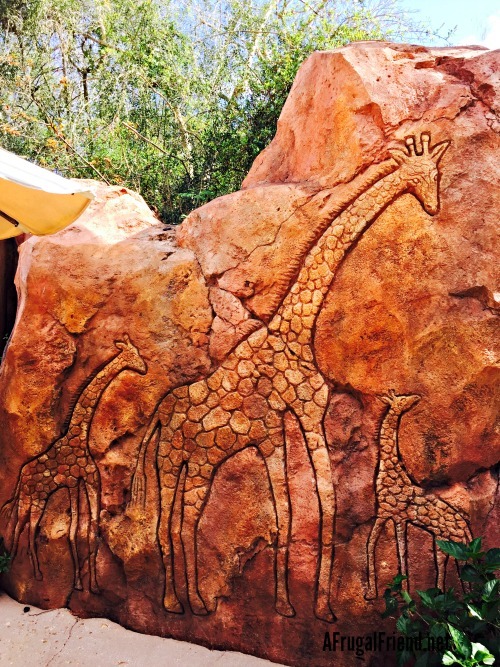 There is a Cast Member stationed here by a large stone formation with three giraffe’s carved into it. There is a Hidden Mickey in the center giraffe. Do you see it? Have the kids try and find it when at the overlook. 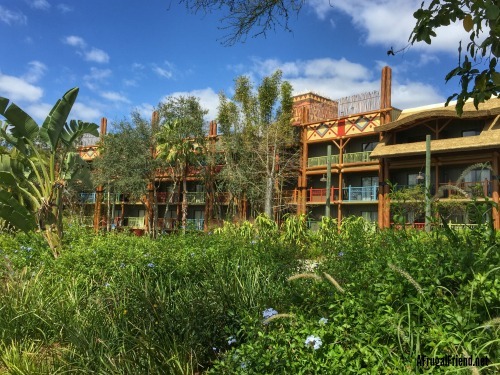 Let’s talk about rooms as that is always on everyone’s mind at Animal Kingdom Lodge! Look at my smile. I truly found my happy place and it was on the balcony. I’ll show you why, but first, let me take you inside……. I stayed in Room Number 2543 and was led there by the Zebra Trail pathway, a colorful expanse of carpets with unique patterns. It immediately set the mood and I knew my room would be impressive. 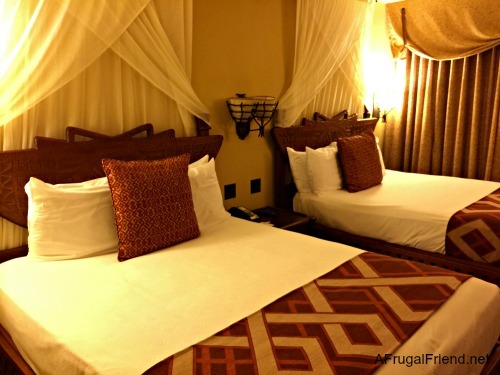 Since my first stay 5 years ago, Animal Kingdom Lodge upgraded the bedding (check out the difference in my older pictures), but I was pleasantly surprised that all the other African touches remained the same. The white netting above each bed reflected what I’d imagine to be common mosquito nets found in African homes and resorts. The unique light fixtures, hanging baskets on the wall and wood carvings on the headboards added the perfect touch. In the bathrooms, the wallpaper was my favorite detail – a map-like wallpaper featuring Africa’s Lake Victoria and animals from the region. With all Disney Deluxe category rooms, you’ll also find the luxurious H2O bath products. Note: Some of my friends had bunk beds in their rooms! 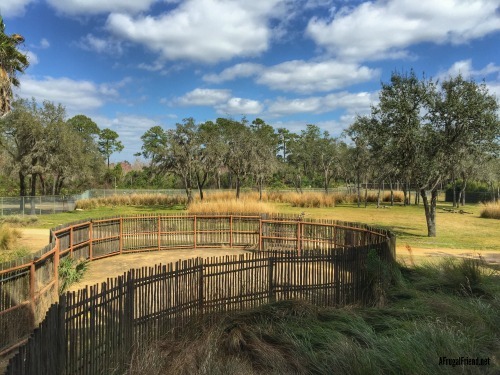 There are many different room categories at Animal Kingdom Lodge, the most coveted being a Savanna view for obvious reasons – animals. SECRET: You don’t necessarily need a Savanna View room to enjoy the animals from your balcony. There were no Savanna View rooms left when I checked in, but because the resort is so massive, many of the rooms are considered to have a partial view, including mine. This was my view to the right and at first I could see smaller animals were on my part of the land, especially larger birds. It did not disappoint. Every morning I was greeted with this scene of two giraffes on the savanna. Though they were behind a fence, this was my view directly outside my balcony and to the left. This was what I’d been waiting for. My favorite thing to do – order room service breakfast and eat out on the patio. There was nothing more peaceful than the sun coming up with the animals looking on. In my opinion that’s worth the splurge on a savanna room, though like I said, I had this view without one. Not all rooms have a balcony, though I’d say most do. During my first stay 5 years ago, we not only did not have a balcony, but we had a view of the parking lot. SECRET: The savanna magic is available to everyone. If a savanna room is not an option, no worries as Disney has made sure the magic is available to everyone. On each floor of the resort, you’ll find open-air balconies available to all guests, complete with amazing views and rocking chairs. 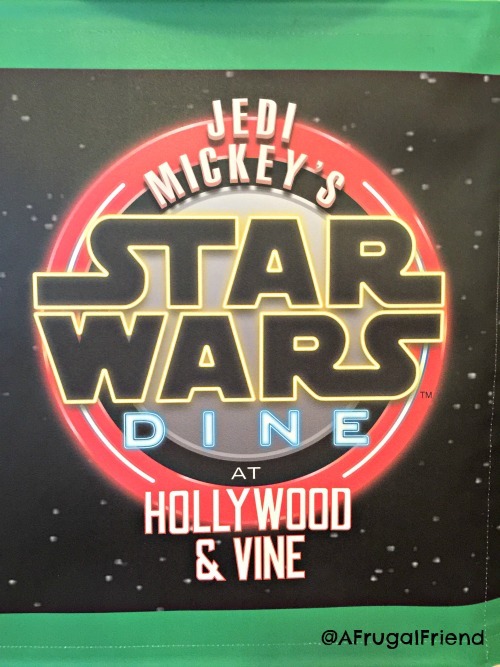 Disney World is home to some of the best restaurants in the country. 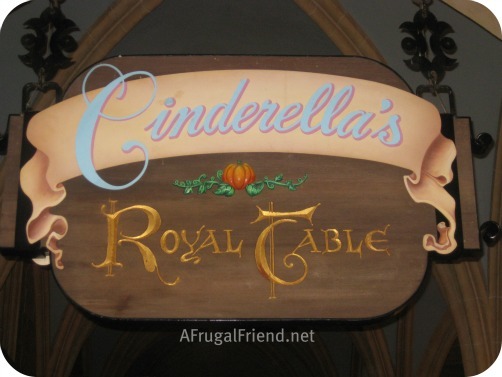 While you may think dining at Disney is filled with character meals and Bibbidi Bobbidi Boo, think again. You’ll find the most amazing sushi at Disney’s California Grill (Contemporary Resort), most romantic venue at Disney’s Victoria & Albert’s (Grand Floridian), and yes, a truly culinary experience at any of the Animal Kingdom Lodge resort restaurants. Though eating at the table service restaurants wasn’t on the itinerary for this trip, I’ve eaten at all but JIKO before and not only do my husband and I LOVE it, but my daughter does too. For buffet service, you can eat at BOMA. For sit down table service try JIKO or SANAA (in Kidani Village). Be sure to check out my dining exprerience at SANAA. 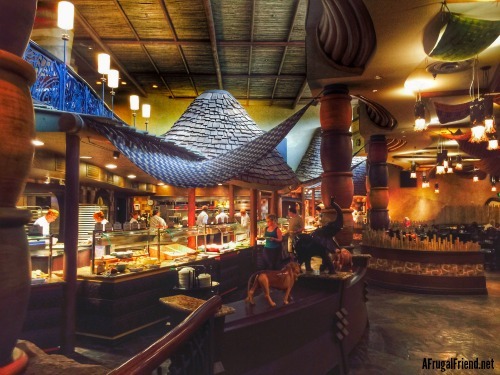 Each venue offers uniquely African dishes, including the buffet at BOMA. No worries as there are plenty of great options for kiddos who might not be as adventurous. A quick service restaurant, The Mara, is available and offers a mixture of African items and classic American options. SECRET: You do not have to eat at BOMA to try the famed ZEBRA DOMES dessert. You can find them in the refrigerated cases at The Mara. What are ZEBRA DOMES? A little African treat – think espresso, cake and white chocolate ganache all rolled into one. Delicious! SECRET: You can find Mickey Waffles on the Room Service Menu for both adults and kids. Remember this for those mornings you want to enjoy your savanna view. The resort is simply stunning…….from the lobby above to the pool grounds below. This is the main area off the lobby which leads out to the Arusha Rock Savanna Overlook. Even if you aren’t a guest at the resort, this is one special place to visit. SECRET: Disney World even provides life jackets for your kids so that you don’t have to pack one. Learned this the hard way after packing one year! 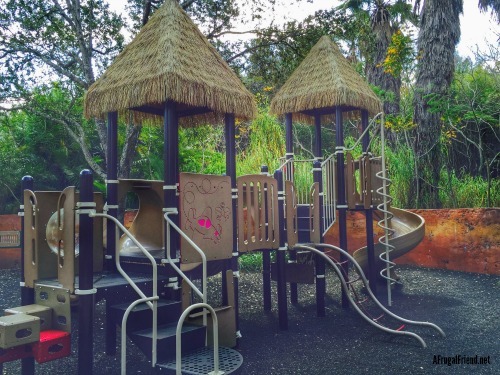 Kids can enjoy the themed Hakuna Matata playground in a shaded area behind the pool. I’m sure you can tell by now why I suggest at least one, if not two, days of just down time at this resort before ever thinking about heading into the Disney Parks. 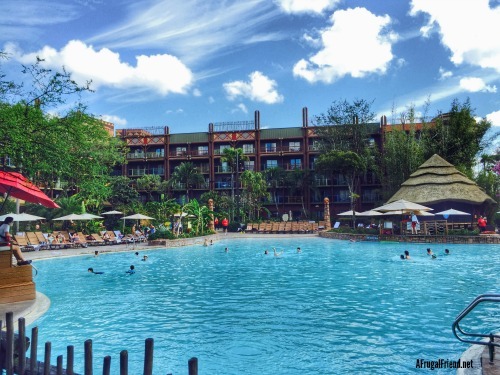 As if taking advantage of the grounds, the restaurants, the pool and playground wasn’t enough, Disney’s Animal Kingdom Lodge makes sure to bring you authentic African activities during the day to make you feel like you are an ocean away from Florida. Each room has a Wildlife Spotting Guide which will help you identify the animals on property, from the Ankole Cattle to the Zebra. Other daily activities are listed on the recreation calendar and include Cultural Immersion, Culinary Exploration, Animal Programs and Wildlife Discoveries. Any stay at a Disney resort provides some extra perks that make it really easy to choose staying on property. Here’s why…. Magical Express – There is no need to rent a car if you aren’t planning on leaving Disney World. Magical Express buses are waiting for you at the airport and will bring you back for your return trip. Televisions inside provide excitement as you arrive. Bathrooms are aboard. In addition, Disney magic will ensure your bags arrive to your resort room – you don’t even need to pick them up at baggage claim. SWEET! (NOTE: Just make sure you have anything you might need in the immediate future in a carryon). Not having the expense of a rental car makes a bid difference in the budget and may make splurging on a savanna room easier! Extra Magic Hours – Guests of Disney Resorts get access either EARLY or LATE at Disney Parks. Hours vary by day and theme park. Take advantage of the shorter lines during these special hours. Magic Bands – These bands are worn on your wrist (kids too) and provide access to your room. You can link a credit card to it so there is no need to bring a wallet with you to the parks or restaurant. Great for kids to give them a little extra independence – they can access for snacks at the pool, etc. 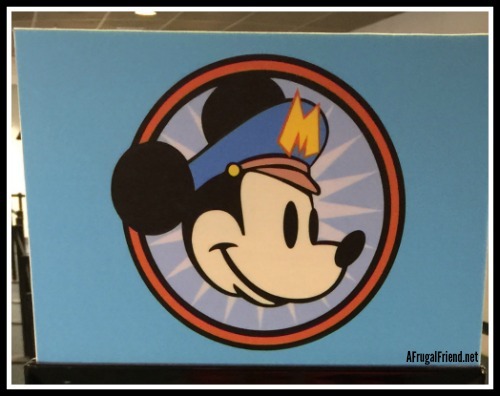 Resort Airline Check-In – Magically, my boarding pass showed up at my door! Talk about service! Package Delivery – Disney will deliver any packages purchased in the theme parks to your resort room (Just make sure not to have this done the night before you leave the resort as they need time). THIS is an amazing service that I always take advantage of. No carrying packages around anymore, no matter the size. 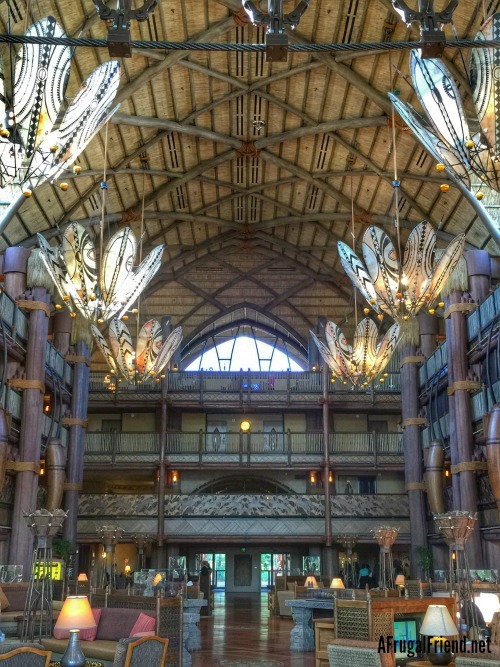 So whether you are a family looking for a unique stay during your trip to Walt Disney World or a couple looking for a romantic venue for a weekend getaway, Disney’s Animal Kingdom Lodge has just what you need. It’s a resort the entire family will be excited to stay at. Even my good friends Nick Wilde and Judy Hopps, from the upcoming Disney animated film ZOOTOPIA, were excited to stay here, and loved the balcony view. They listened attentively as I told them all about Animal Kingdom Lodge Secrets! Yes, Disney held a full press junket at Animal Kingdom Lodge this past week. The ideal setting for a film about animals. Press, cast (yes, Jason Bateman), directors and more enjoyed the resort for several days during the junket. Stay tuned, as over the next week I’ll be bringing you more on my stay at Disney World, including my interviews with Jason Bateman, Ginnifer Goodwin, directors – AND my movie review of ZOOTOPIA! Take a glimpse of ZOOTOPIA…. 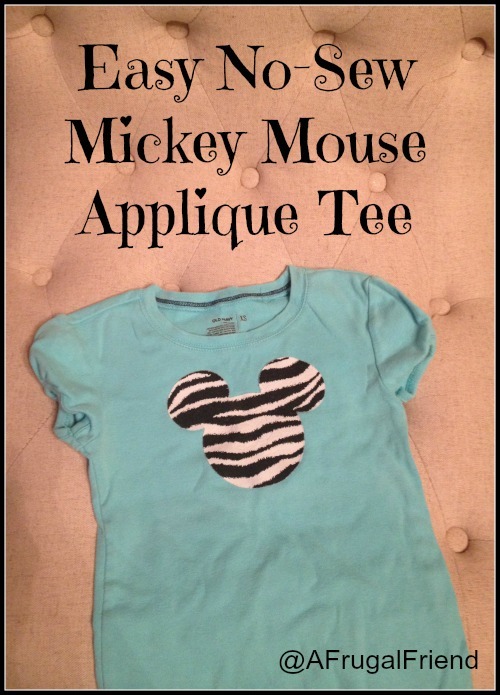 If you like this post, you’ll love these that I’ve picked out just for you! Don’t forget to check out my travel tab for even more Disney posts. The zebra domes are indeed delicious. Animal Kingdom Lodge is definitely one of the most unique resorts at WDW – hoping that we’ll stay there on one of our trips in the future! I’ve been wanting to stay here for years, and my dream is finally coming true! So excited for our upcoming trip after reading this post. Thanks for sharing your experience and beautiful photos, Debra! What a lovely place to stay! I’d never heard about all the free activities they offer onsite either. Face painting and cookie decorating?! So cool! David and I just have to make a trip back to Animal Kingdom Lodge. We simply didn’t have enough time to explore the grounds the way we wanted. What a wonderful stay you had with so many fun things to see! Every time we go to Disney we eat at Boma (my daughter loves the seafood stew that has mussels in it, and my husband and I love pretty much everything else on the buffet!) and sneak around the lodge to look at animals, play on the playground, etc. It is a beautiful place. Maybe someday we will actually get to stay there 🙂 Glad your family had such a lovely time there. LOVE this post and wish I had seen it sooner. We just got back from Disney and stayed at Dolphin because it was free with our hotel points, but did eat at Saana and loved it!! Great views! You can’t beat Free with Points! How was the Dolphin…have always loved the prices at the Dolphin and Swan too but never stayed there! Wow. This place sounds so magical and beautiful. I would love to go there with my family one day.